So far we’ve explored how to create a map and how characteristics and techniques change as components evolve. Before exploring some of the wider impacts of this both in terms of macro and microeconomics along with how to exploit the map to create an advantage, I’d like to take the reader on a short detour to explain some common phenomenon we see today in business. The two issues I wish to examine before getting us back on track are the perils of outsourcing and the issue of business alignment. Outsourcing is a global practice that is often disparaged in the popular press due to associations with excessive costs and failure. The problems are generally not with outsourcing per se but instead what is outsourced. The concept of outsourcing is based upon a premise that no organisation is entirely self-sufficient nor does any have unlimited resources and some work can be conducted by others at a lower cost. The organizational focus should not therefore be on the pursuit of capabilities that third parties have the skills and technology to better deliver and can provide economies of scale. This practice is common in all industries; the machine manufacturer doesn’t have to make its own nuts and bolts and can instead buy those from a supplier. Anyway, that is the theory but what about the practice? A case study research project undertaken by Lacity which examined data on the success rates of IT based outsourcing projects showed that only 50% of respondents rated their outsourced IT projects as satisfactory or above and over 29% rated dissatisfaction or below. Other studies have shown that only 5% of organisations have achieved high level benefits from outsourcing IT projects. These failures are not just an IT phenomenon, the manufacturing industry has several high profile cases of where outsourcing component manufacture has led to excessive costs and delays. Boeing’s 787 Dreamliner is an often-quoted example. So what is going wrong, the premise seems sound enough? In IT, it is not uncommon to treat entire projects as single things. For example, we will take the Fotango value chain and imagine that we had decided to outsource the development and maintenance of Fotango to a third party on the assumption that the Fotango system was a single thing and someone else could better provide it with economies of scale. Being a consumer of these outsourced services, we’d want to ensure that we’re getting value for money and the features we require are delivered when they are expected. Hence the process of outsourcing often requires a well-defined contract for delivery based upon our desire for certainty i.e. we’re getting what we expect and paid for. 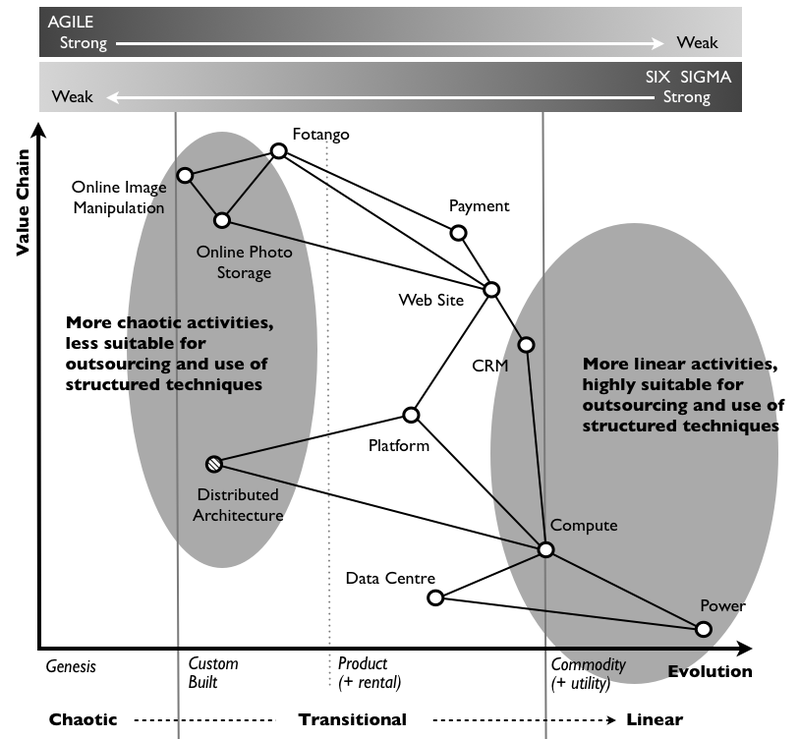 As a result both parties will tend to treat the entire activity as more linear and hence structured techniques are often applied with formal specifications and change control processes. 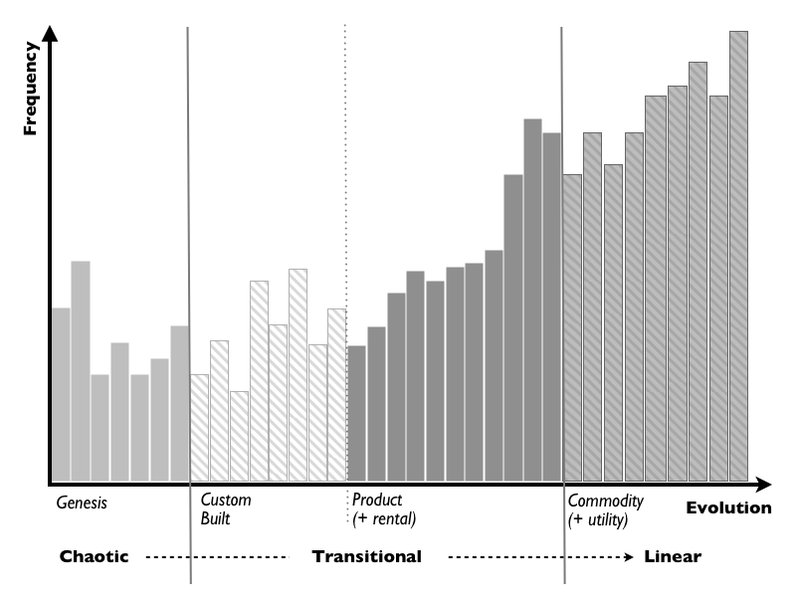 However, looking at the Fotango system through the lens of value chain vs evolution, we can see that whilst some components are linear (e.g. compute resource, installation of a CRM system), other components are clearly not (e.g. image manipulation system). The more chaotic components will inevitably change due to their uncertain nature and this will incur an associated change control cost. In a review of various studies over the last decade, the most common causes of “outsourcing” failure have been cited as buyer’s unclear requirements, changing specifications and excessive costs. However, it’s the very act of treating large-scale systems as one thing that tends to set up an unfavourable situation whereby the more linear activities are treated effectively but the more chaotic activities cause excessive costs due to change. In any resultant disagreement, the third party can also demonstrate this by showing that the costs were incurred due to client’s changing of the specification but in reality those more chaotic activities were always going to change (see figure 13). The “excessive cost” associated with these changes should be unsurprising as a more structured technique is applied to a more chaotic activity. A better approach would to subdivide the large-scale project into its components and outsource those more linear components. In today’s world, this is in effect happening where well defined and common components such as compute resource are “outsourced” to utility providers of compute (known as IaaS – infrastructure as a service). Or equivalently, well-defined and common systems (such as CRM) are “outsourced” to more utility providers through software as a service. Those more chaotic activities offer no opportunity for efficiencies through volume operations because of their uncertain and changing nature and hence they are best treated on a more agile basis with either an in-house development team or a contract development shop used to working on a cost plus basis. Outsourcing itself is not an inherently ineffective way of treating IT, on the contrary it can be highly effective. However, it’s important to outsource those more linear components that are suitable to outsourcing. One of the more popular questions in management articles is how to maintain alignment between IT and the business and other functions of the organization such as marketing or finance. IT departments are frequently described as being “too slow” or “not innovative enough” or “unreliable and inefficient”. 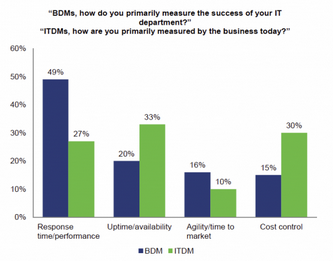 Figure 14 – IT and Business Development views on measurement. The problem again appears to stem from evolution and how we treat activities, to explain why let us consider any reasonable sized company with various value chains consisting of hundreds of component activities. 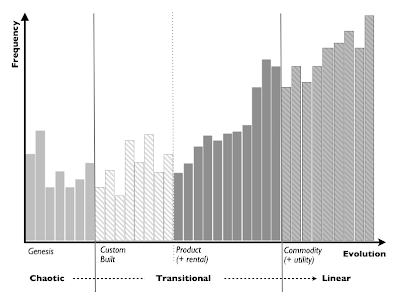 The component activities will all be evolving and so the organization is best viewed through the lens of a profile – i.e frequency of activities at various stages of evolution (see figure 15). We tend to organize by type i.e. this component is more of an IT activity whereas this component is more of a Marketing activity. As a result we create departments with each having a profile i.e. 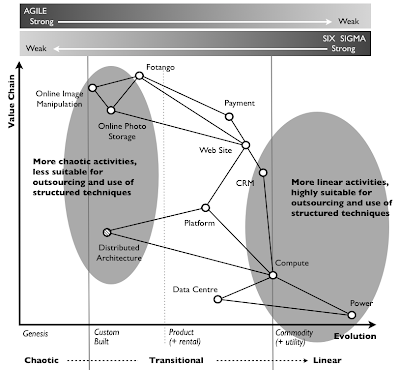 contain a spectrum of activities with characteristics varying from more chaotic to more linear. IT, typically tends to serve other departments i.e. it provides components activities which are consumed by other groups. For example, the provision of compute resource, storage, web server and database for a Marketing micro site or a Financial reporting system. Now, as activities evolve, new activities appear and this change happens at different rates in different industries but also for different types activities. Hence profiles change over time and the balance between chaotic and linear changes. For example, recently the focus has been on marketing innovation with social media, sentiment analysis and large-scale analytics whereas the Financial and Operational focus is more on cost, reliability and repeatability. Over a decade ago, a quite different focus existed with an emphasis on Financial and Operational innovation through process re-engineering and the introduction of global ERP whereas Marketing was slanted towards regular, reliable activities such as large scale email broadcasting and newsletters. When a tendency towards a one size fits all approach exists, then these consuming departments will lurch from an emphasis on innovation to efficiency and back again. For a group serving multiple departments then it will constantly be pulled in both directions and should it apply a one size fits all approach it will always be out of alignment with one group i.e. “too slow” or “unreliable and inefficient”. Today, IT is likely to be pulled towards cost control and reliability by the Finance department and toward Innovation and rapid change by the Marketing and Business development group. The issue of alignment within these groups tends to be an artifact of the way we organize ourselves (i.e. grouping by type) interacting with the constant evolution of activities and our predisposition to one size fits all. There are solutions to both problems but for the time being it is enough for the reader to recognize that the perils of outsourcing and alignment issues have a common cause – the inability of some organizations to deal with the impacts of evolution. Neither symptom can be alleviated without first dealing with this cause. Next post in series ... Everything Evolves.